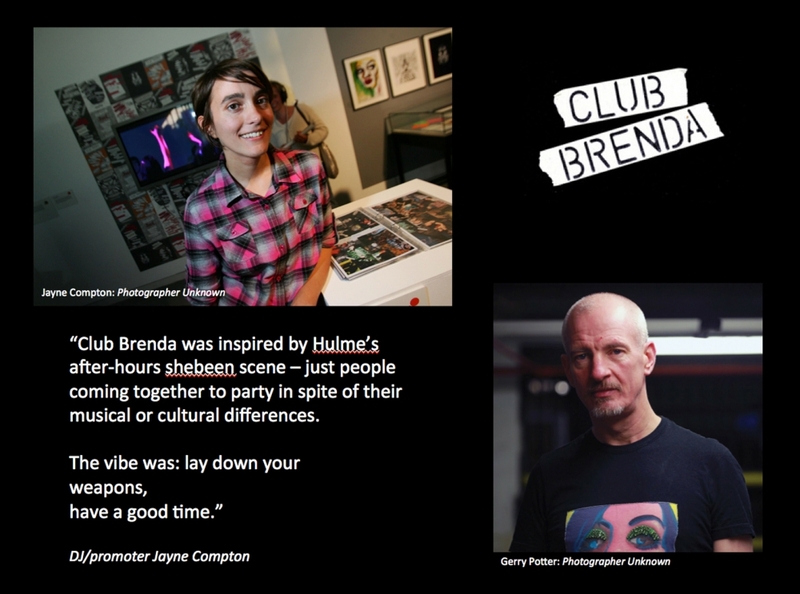 "Club Brenda began back in the 20th century – 1999 to be precise, after a drunken conversation between DJ Jayne Compton and her friend, the performance poet, Chloe Poems. They were on the night train back from Cream in Liverpool. So this is how Brenda, Manchester’s ugliest duckling, hatched. Inspired by Hulme’s after-hours shebeen scene, Jayne wanted her night to embody the same spirit: people coming together to party in spite of their musical or cultural differences. It would be open and gay friendly. The vibe was 'lay down your weapons; have a good time’. This ethos, combined with a passion for performance art and breaking bands, set the tone for he early Brenda nights. People would just grab the mike and recite poetry. Anything could happen. Performers like Tracy Elizabeth, Fiona Bowker and Veba all contributed, inspiring Jayne to start the highly successful Switchflicker label, which captured the best of these moments on limited seven inches. As Switchflicker went from strength to strength, eventually launching Ting Tings, The Divine David and Magic Arm, Brenda nights grew broader in scope and sophistication. Jayne spread her wings and dragged the whole shebang over to Berlin’s ‘West Germany’ club for two parties that are still spoken about in debauched whispers. Venues that have hosted the night across Manchester have included The Star and Garter, Islington Mill, The Music Box, and current home The Deaf Institute. There are plans to invade New York. Ten years on, Club Brenda is still minimally promoted and succeeds due to word of mouth from its misfit crowd. It is a genuinely uncompromising underground art-punk happening in the mould of Exploding Plastic Inevitable, Rabid at the Squat or Don Letts at The Roxy. The punters are as important as the acts. So is the feeling is that everyone knows each other. It's built on friendship and love." Jayne Compton now runs Kraak club space and gallery.